His degrees in Mathematics and Mechanical ENGINEERING (from the University of London), led to a position on the academic staff of the University of Glasgow. On returning to India, he become a Senior Consultant to Pheroze Kandianavala & Associates, one of India’s leading architectural practices, where he pioneered the concept of fire safety in multi-storied buildings.His articles on CINEMA led to an appointment to the Board of Film Censorswhere he proposed a simplified and liberal censorship code which would be adaptable to changing times and moral values.He then became a promoter of New Cinema in India by first being in charge of Scripts and Production, and then heading the Film Finance Corporation which then became the National Film Development Corporation. During this period many young film-makers made their first films. Notable amognst them were names like Govind Nihalani, Vidhu Vinod Chopra, Saeed Mirza, Ketan Mehta, Aparna Sen and many others. It was also at this time that Sir Richard Attenborough brought his script of Gandhi to NFDC, and the Corporation became the multiple Oscar winning film’s Co-producer. As a JOURNALIST, ANIL DHARKER has been editor of the some of India’s best known publications, such as The Illustrated Weekly of India (India’s oldest English language magazine), The Independent (described by Dr Manmohan Singh as ‘India’s best newspaper’) and Mid-day, India’s largest evening newspaper. Through the years ANIL DHARKER has been a columnist for many of India’s leading newspapers such as The Times of India, The Economic Times, The Hindu and DNA. He has also been a columnist for Gulf News and Khaleej Times. Foreign publications he has written for include The Independent (London),The Scotsman (Edinburgh), The Glasgow Herald, Foreign Policy (Washington). Anil Dharker’s interest in the medium of TELEVISION led to him becoming President of Dalal Street Journal’s channel India TV, then poised to take off. He was later briefly Creative Director of the Zee Television Network and Chairman of Kaarnik Communications, a TV software company. Anil Dharker is the HONORARY CONSUL for Luxembourg in Mumbai for Maharashtra, Gujarat and Goa. 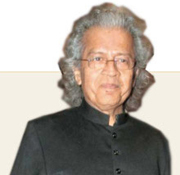 He is on the Advisory Board of several FILM FUNDS for the production of films in India. Anil Dharker is the Festival Director of the MUMBAI LITERARY FESTIVAL.